There is just something magical about wild horses. I’ve photographed wildlife for nearly two decades now, blessed with incredible experiences with everything from bald eagles to penguins. But wild horses are truly in a category of their own. I think it’s because while horses are not rare, wild horses are. There are only a half-dozen places in North America to even see wild horses. 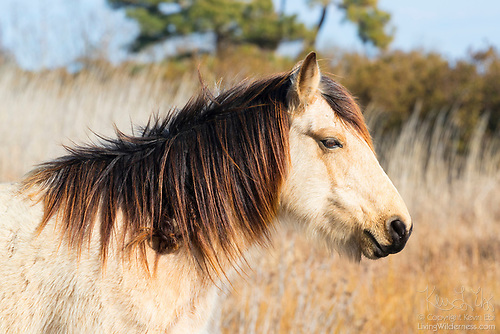 I recently got a chance to spend time with the horses in one of them: Assateague Island on the coast of Virginia and Maryland. About 300 horses live on the island. 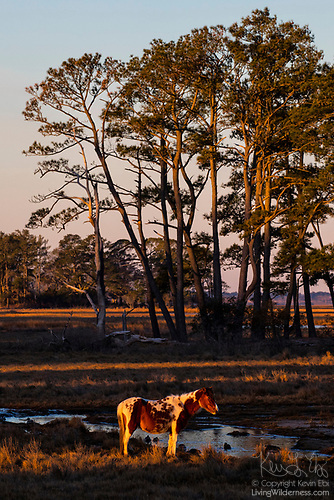 On the Maryland end, Assateague Island is considered a National Seashore — as much as possible, it’s pristine wilderness, though park officials do give the horses birth control shots to keep the population down. The Virginia side is a wildlife refuge — Chincoteague National Wildlife Refuge, named after the closest town, even though it’s on a different island — with more hands-on management. Refuge horses are “owned” by the fire department. Each summer, cowboys round them up and a certain number of horses are auctioned off to live elsewhere. 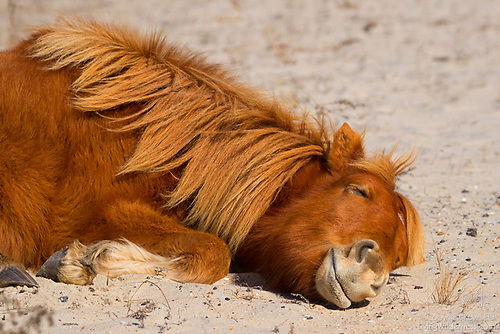 There is some dispute as to how horses got on Assateague Island in the first place. Some researchers believe the horses are the survivors of a shipwreck, the sinking of the Spanish galleon La Galga. It sank just off the Maryland/Virginia coast in 1750 — just before people started reporting bands of wild horses on the island. The U.S. 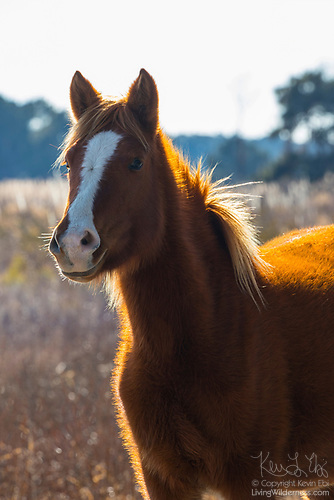 Fish and Wildlife Service suggests the Assateague horses may be descendants of those owned by early colonial settlers who released them to the barrier islands to graze, both to avoid having to build fences and paying livestock taxes. It took me a little while to find the horses. I stopped in at the Chincoteague visitor center and was told they are visible from the road in the southern marsh about 90 percent of the time. I immediately went there and saw two horses way off in the distance, beyond even the reach of my strongest lens. I decided to go birding for a while and then checked back in at the marsh. No change. So, I went for a hike. The northern end of the refuge is a bit more difficult to access. There’s a road that circles a marsh, but it’s open only a couple hours a day. You typically have to go in on foot. And I did. About 10 minutes from the parking lot, I began seeing evidence of horses. This is the non-glamorous part of nature photography. One way you can find wildlife is by tracking fresh — well, um — droppings. I saw a pile on the trail. And another. Then another. Then there were horses. There was a band of about a dozen that were feeding in the marsh. 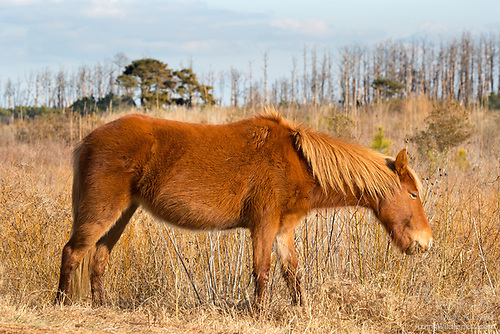 On Assateague Island, the horses have to feed almost constantly. Unlike the grass horses would find on a farm, the cord grass here is very low in nutrients. They have to eat all day in order to get enough calories. With the Atlantic Ocean just a few hundred yards away, it’s also a saltwater marsh. Every bite is a salty one, so they have to drink twice as much as horses elsewhere. This high-sodium diet makes them appear somewhat bloated. Also because of their poor diet, they’re short — small enough to actually be classified as ponies. On average, they are about 4 feet tall (or 12 to 13 hands in the typical unit of equine measurement). 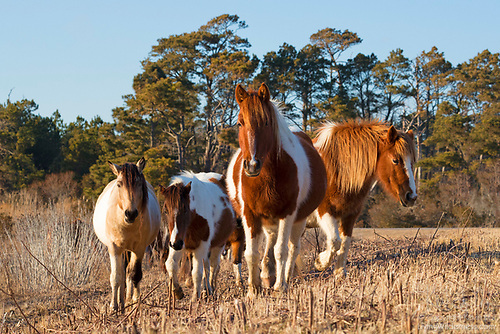 Assateague horses are also known as Chincoteague ponies. I initially started photographing them from about 100 feet away, but it was obvious they weren’t the least bit concerned about my presence. On their own, they decided to inch closer — eating, eating, constantly eating. I had the horses to myself for a couple of magical hours and then the marsh road opened to vehicular traffic. Soon the road was packed with cars. The horses weren’t afraid of them either, but now having to dodge cars, it became harder for me to get into a position to capture the horses in the low-angled light of winter. I returned to the refuge the following morning. Temperatures that night dropped to about 20, so a fair amount of the marsh was frozen. 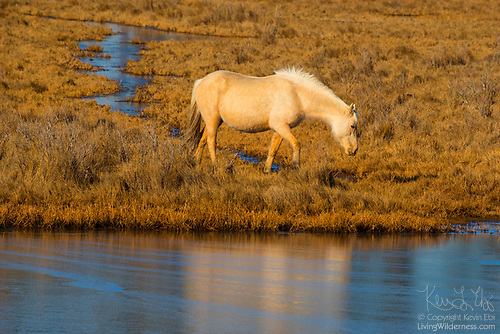 I captured horses feeding next to patches of ice, a testament to their ability to adapt to the tough environment. I also got a chance to explore the Maryland side of Assateague Island and found the horses there tended to spread out a bit more. Rather than a band of horses feeding together, I found one pair feeding on the beach. My favorite image there came when the mare took a brief break from feeding to squeeze in a 15-minute nap. My time on Assateague Island was my second experience with wild horses. 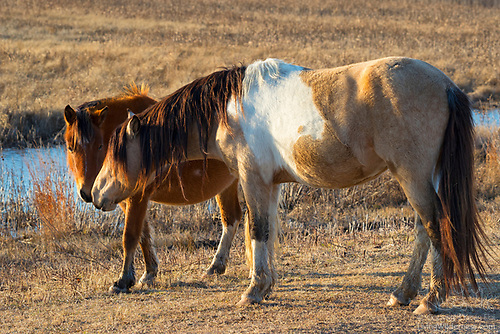 Years ago, I got to photograph a band of horses in Theodore Roosevelt National Park in North Dakota. Some of the images from that work are in my national parks book, Our Land. The horses may not be wild in the sense that, say, an alligator is wild, but any time with them is an amazing experience.